How design ideas for a seafoam green guest bath were collected over time and evolved. 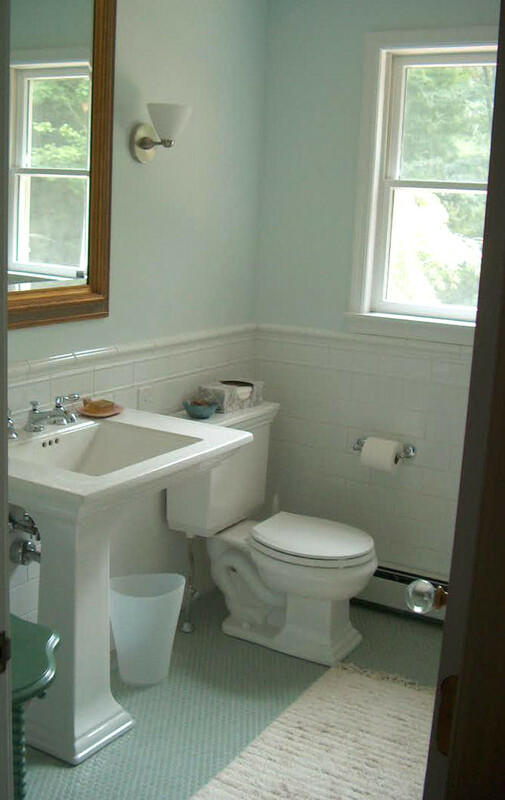 The prototypical seafoam and white cottage style bathroom could be called a new classic. Variations are as numerous as shades of green and vary from old-fashioned hues on the tasty side of mint to the elusive color of water. The hallmarks include white fixtures and beadboard wainscot also painted white. Floors generally lean towards small tile patterns such as hex, penny rounds, or herringbone but marble tile or even painted wood is used. 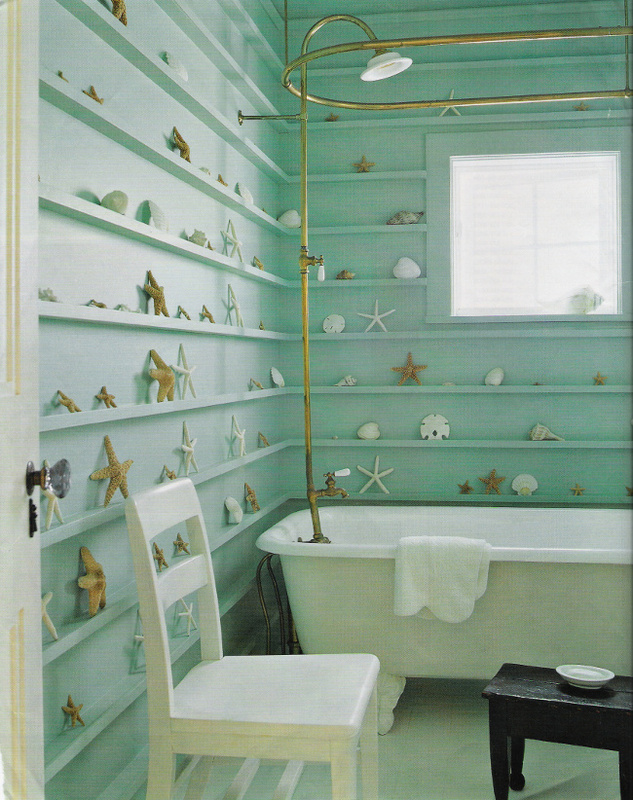 My own guest bath [top] is a seafoam and white confection. The idea began with several unrelated photographs collected over a long period of time. I could call them inspiration photos but each one had just one or more ideas. I need to thank French designer Jacques Granges first for the color. An article in Elle Décor on a bath he created in a French country house gave me the general idea for a peaceful hue I had never really considered. I wasn’t going for all the fussy display or the shallow shelves but the seafoam and white palette is here. Pedestal sinks were a given for me because I don’t care for bathroom vanity cabinets. 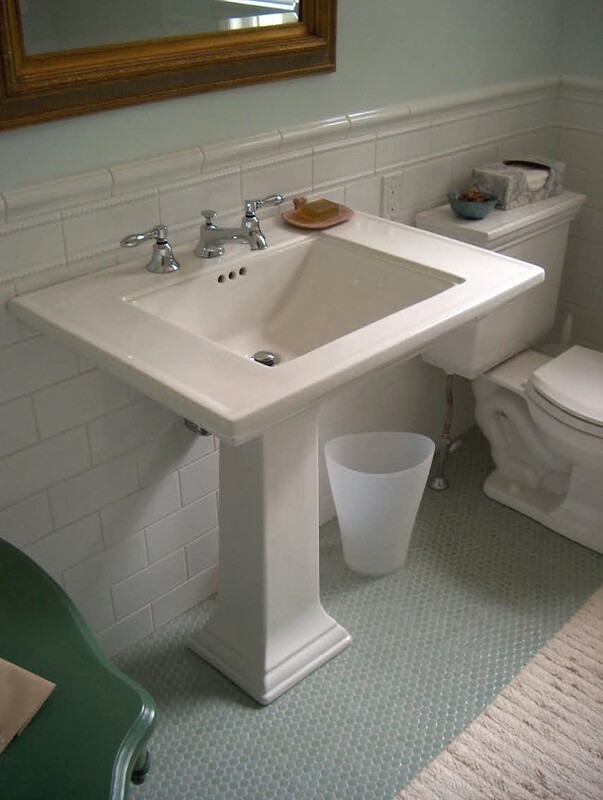 The Kohler Memoirs sink is a gem, with a broad deck for setting things down, generously sized bowl, and comfortable height at 36-inches tall. Instead of wood beadboard behind the sink we used white glazed Adex Portuguese subway tile that is as modern as it is cottage in style but finished the wall in a similar way. Green penny round Ann Sacks tiles anchored the seafoam color on the floor and let me color match the paint. However, when we slid a sample of my floor tile into the analyzer machine at the paint store, it spit out Benjamin Moore’s Hollingsworth Green as the most accurate color match. When the swatches went up, the walls looked too yellow and dark. Ben Moore’s Seafoam was lighter and bluer than the tile but changes in the light. Once on the wall, it proved to be a wonderful match. Perhaps more than any other element, the seafoam wall color infuses the bathroom with the airy, luxurious sense of peacefulness I was trying to achieve. It’s in the same family as the Grange bath but less saturated. Another inspiration was the guest bath in a friend’s home in Vermont, where I took a quick snapshot. 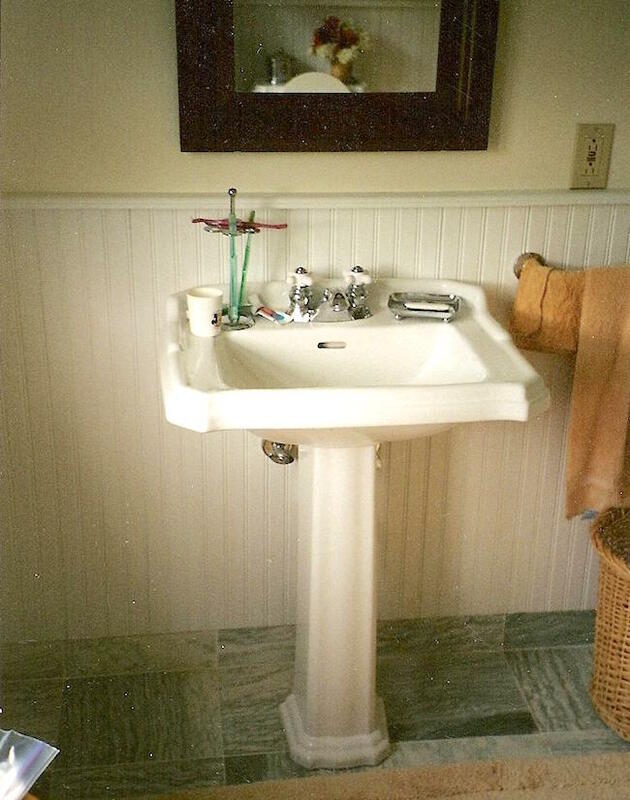 Here, a pedestal sink was set against white-painted beadboard. The floor also was green but darker Vermonth green marble tiles were used. A third, snapped in a friend’s guest house bathroom, helped set the style. 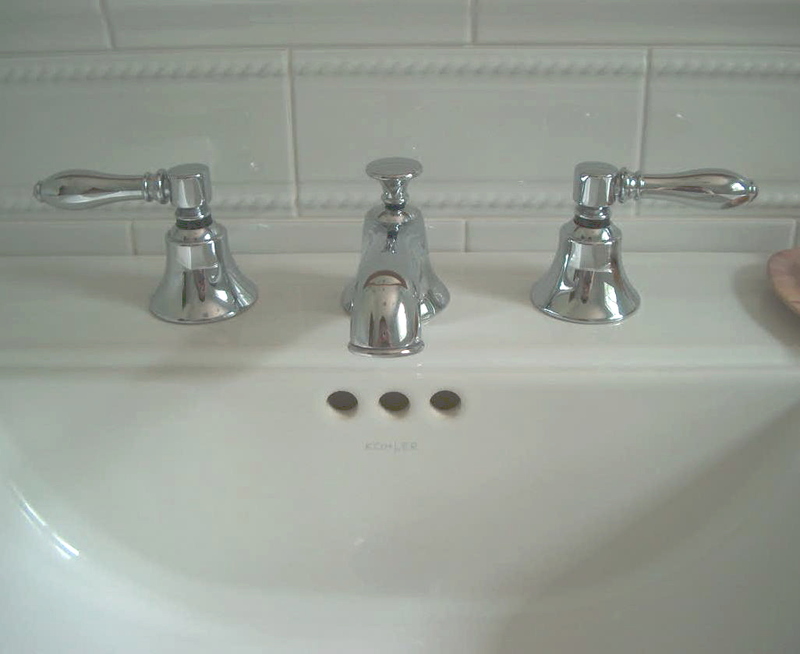 While the sink and window walls in this bath are seafoam, the other two walls are white. That’s because the tub enclosure is fully tiled with the white Adex subways. What’s left over is white-painted beadboard floor to ceiling. 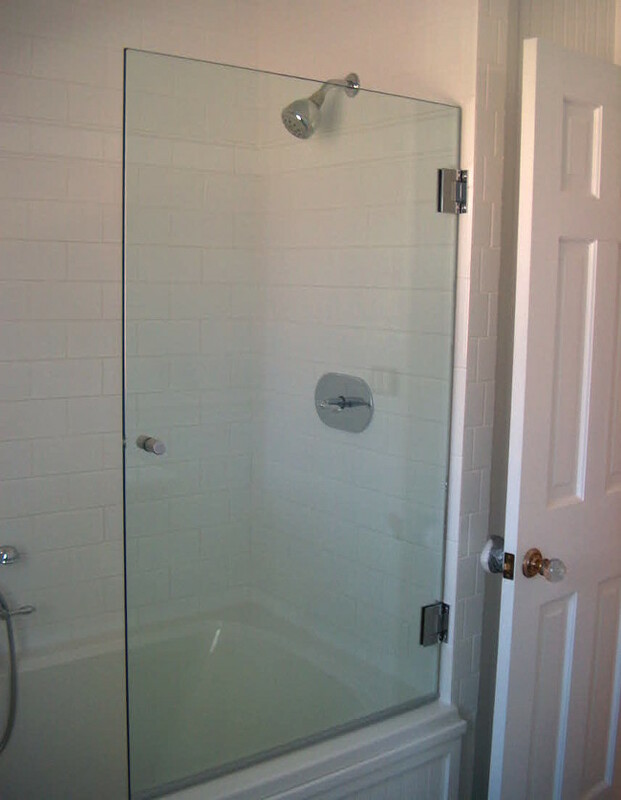 That includes the tub enclosure which has a hinged glass shower guard with a handle for use with the shower. The glass swings away so the Bain Ultra air jet tub can be used as a spa style bath. The glass shower guard really helps the tub do double duty without creating the feeling of being closed in. My idea for that came from a glass shower guard in a Cannes hotel room where I stayed on a press trip. I can’t recall why I took the photo of the shower except that it intrigued me. It certainly wasn’t very pleasing aesthetically. Fortunately, I stumbled over the photo nine years later at precisely the moment I needed to hand it to the contractor to show him what I wanted for the tub! From time to time, I think about repainting. Metallic silver has been a candidate for wall color, to tie into the chrome Dornbracht Jefferson faucets and Restoration Hardware nickel towel bars. 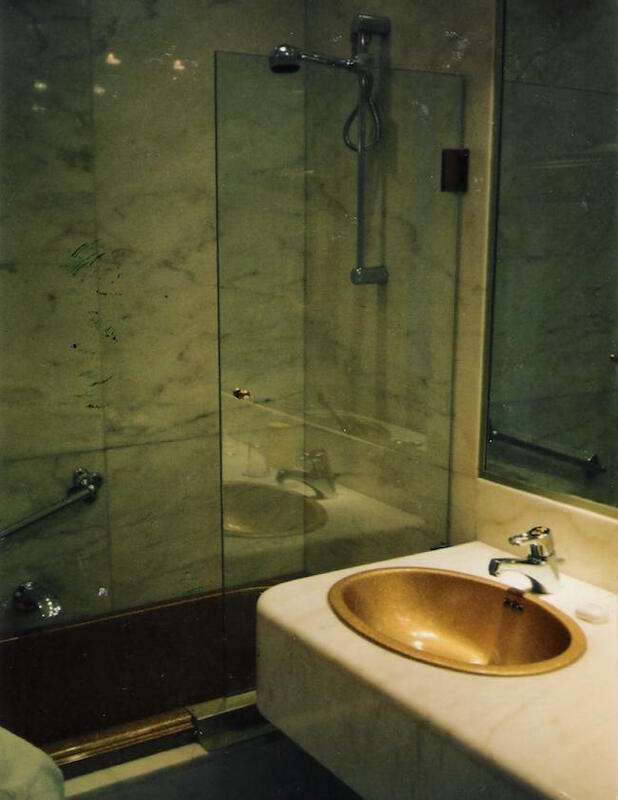 Silver also would play off the gold-leaf mirror frame over the sink. On second thought, silver feels too dressy. Perhaps it’s better not to disturb the zen. You also might like Beachy Bathrooms and Bathroom Blues.